On the eighth anniversary of Syria’s crisis, this timeline shows how the war flared, the country splintered, foreign powers waded in, peace-making efforts failed, and Russia eventually helped Damascus drive back rebels. * March 2011 – The first protests against President Bashar al-Assad quickly spread across the country, and are met by security forces with a wave of arrests and shootings. * July 2011 – Some protesters take up guns and military units defect as the uprising becomes an armed revolt that will gain support from Western and Arab countries and Turkey. * January 2012 – A bombing in Damascus is the first by al Qaeda’s new Syrian affiliate, the Nusra Front, which gains in power and starts crushing groups with a nationalist ideology. * June 2012 – World powers meet in Geneva and agree on the need for a political transition, but their divisions on how to achieve it will foil years of U.N.-sponsored peace efforts. * July 2012 – Assad turns his air force on opposition strongholds, as rebels gain ground and the war escalates with massacres on both sides. * April 2013 – Lebanon’s Hezbollah helps Assad to victory at Qusayr, a battle seen as halting rebel momentum and showing the Iran-backed group’s growing role in the conflict. * August 2013 – Washington has declared chemical weapons use a red line, but a gas attack on rebel-held eastern Ghouta kills scores of civilians without triggering a U.S. military response. * January 2014 – An al-Qaeda splinter group seizes Raqqa before grabbing swathes of territory across Syria and Iraq, declaring a new caliphate and renaming itself Islamic State. * May 2014 – Rebels in the Old City of Homs surrender, agreeing to move to an outer suburb – their first big defeat in a major urban area and a precursor to future “evacuation” deals. * September 2014 – Washington builds an anti-Islamic State coalition and starts air strikes, helping Kurdish forces turn the jihadist tide but creating friction with its ally Turkey. * March 2015 – With better cooperation and more arms from abroad, rebel groups gain more ground and seize the northwestern city of Idlib, but Islamist militants are taking a bigger role. * September 2015 – Russia joins the war on Assad’s side, deploying warplanes and giving military aid that soon turns the course of conflict decisively against the rebels. * August 2016 – Alarmed by Kurdish advances on the border, Ankara launches an incursion with allied rebels, making a new zone of Turkish control that it later extends in 2018 to Afrin. * December 2016 – The Syrian army and its allies defeat rebels in their biggest urban base of Aleppo after months of siege and bombardment, confirming Assad’s growing momentum. * January 2017 – Russia, Iran and Turkey start talks in parallel to the faltering U.N. peace effort, but the opposition believes the results help Damascus consolidate its gains. * March 2017 – Israel acknowledges having conducted air strikes against Hezbollah in Syria, aiming to degrade the growing strength of Iran and its allies. * April 2017 – The United States launches a first cruise missile attack on a Syrian government airbase near Homs after a poison gas attack on the rebel-held town of Khan Sheikhoun. * November 2017 – U.S.-backed, Kurdish-led forces defeat Islamic State in Raqqa. 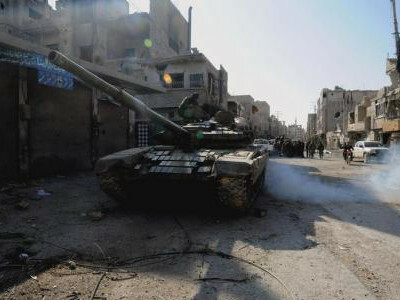 That offensive, and a rival one by the Syrian army, drives the jihadist group from nearly all its land. * April 2018 – The Syrian army recaptures eastern Ghouta, before quickly retaking the other insurgent enclaves in central Syria, and then the rebels’ southern bastion of Deraa in June. * September 2018 – A Russian-Turkish deal over Idlib and the rebel-held northwest freezes the front lines, but jihadists seize control of much of the area and violence continues. * March 2019 – As its local allies take Islamic State’s last area in the east, the United States decides to keep some troops in Syria after earlier saying it would pull out, reducing the chances of a security vacuum that might spark a new bout of fighting.